- Mining machines and combines of the Neogene period - what they were like? - Humanitarian mission in the Neogene – the heroes who saved victims of flood who had taken refuge underground (continuation of the article “Automobile roads (cart ruts) of the Neogene time in Central Turkey”) и др. However, given that the evidences of existence of a Neogene civilization in this region were so clear and obvious, and, what is more, allowed me to extend the area in which the underground and ground-based megalithic complex was present to the far west of Europe, I decided to look into this matter one more time. In this resumptive article I will not cite the evidences – the exhaustive number of them is reviewed in my previous works and expedition reports. I have organized this article as a group of theses in order to be easily comprehended. It will briefly tell you about the real history and archaeology of the Mediterranean region, which has nothing to do with the predominating versions of them in the historical and archaeological literature. My investigations at the junction of geology and folklore and the wide variety of the objects of study in different countries of the Mediterranean region and south-eastern Asia – Crimea, the part of Caucasus situated in Russia, Turkey, Israel, Jordan, Bulgaria, Spain, Sri Lanka, Thailand, Cambodia – has allowed me to draw the following conclusions. 1) Ruins of underground and megalithic rock cities and structures of Neogene dated Middle-Late Miocene (15-6 million years ago) are widely spread in Spain, Portugal, France, Italy, Germany, Romania, Bulgaria, Malta, Crimea, Israel, Lebanon, Jordan, Syria, Turkey, Armenia, Azerbaijan and other countries*** of Mediterranean region. These ruins are part of the underground and ground-based megalithic complex, or underground rock complex, which I discovered and which is at the base of many archaeological sites from 10th millennium B.C. to 1st millennium A.D. and Medieval cities, such as: Bocairente, Espera in Spain; Sorano, Sovana, Pitigliano in Italy, etc. 2)Ruins of rock, underground and megalithic cities and towns from Neogene are often connected with each other by stone roads, parts of which can be traced in the areas where friable Pliocene-Quaternary deposits are present, and which form the global network of Neogene roads and ruts in Spain, Italy, Malta, Turkey, Crimea and other countries***. 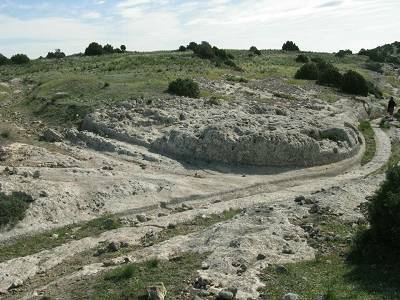 Moreover, apart from stone roads, some places, such as Phrygian Valley and Cappadocia in Turkey, have areas with a large number of petrified ruts left by the transit of wheeled transport, e.g. automobiles or cross-country vehicles of Neogene, which occurred on a one-time basis. 4) Wells, stairs, pits, trenches, graves “carved” in rock and other manmade structures are widely spread on the Neogene leveled surface. When I studied these structures, roads and ruts and juxtaposed them to their modern equivalents, I came to the conclusion that most of these structures were not carved in rock, but were rather left or dug out in the ground at a point in time when it was in a ductile state. According to the geological history of the studied areas, it could only be possible in the Middle-Late Miocene. 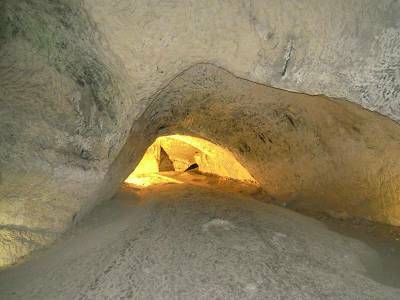 5) It appears to be very unlikely that the rock and underground cities were dug out in the already petrified ground, as in the case with the underground dwellings in Guadix (Andalusia, Spain). Apparently, they have been altered and renovated many times even after acquiring their present solid state as rocks and hills. 6) Apart from ruins of Neogene rock underground and megalithic cities, dwellings, roads, pits, ditches, wells, graves and stairs carved in rock, some places in the Mediterranian region (Sierra-Mariola, Sierra de la Pedrera, Sierra Pela in Spain) still have stone terraces on the hillsides and drainage systems of Neogene period, almost identical to their modern analogs. 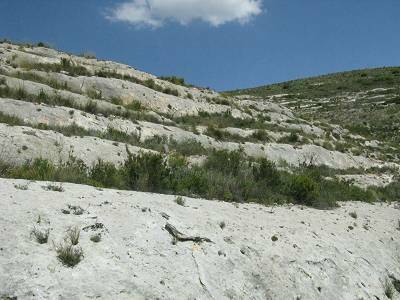 7) Some segments of the Neogene stone roads and the base of the stone ruts that we examined in a range of sites (Padul, Sierra-Mariola in Spain) bear an incredible resemblance to the modern asphalt roadbeds and dirt roads which contain gravel and break stone. This can also serve as an evidence for the existence of an advanced civilization in Neogene. 8) A feature that is peculiar for the rock cities, settlements and landscapes and which again indicates a presence of an advanced civilization in Neogene is the processing of stone forming the mountain ranges, rocks and cliffs, performed either by humans or other intelligent forms of life and giving them the shapes of geometrical forms, people, animals, birds and fish and also altering of a whole landscape. I have seen manmade mountain ranges (“The Sleeping Woman” and “The Sleeping Man”) near the Menga dolmen in Spain, a dragon-shaped mountain in Sigiriya, Sri Lanka, mountains in the shapes of elephants, camels, dogs and birds on the Big Yazılıkaya plato, Turkey, and the sides of the Love Valley in Cappadocia, all carved with bas-reliefs depicting humans and animals. According to the A.A. Grigoriev’s book “Stone statues. The indicators of the exploration of Earth” (Saint-Petersburg, 2015), similar anthropomorphic and zoomorphic mountains, rocks and bas-reliefs are widely spread over the Earth. 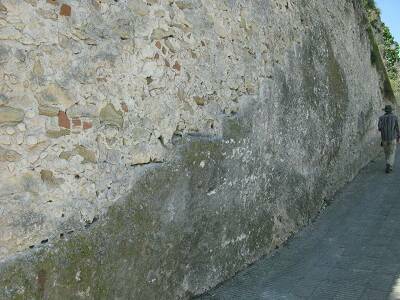 9) The surface of the walls in many of the halls and rooms in the rock and underground cities, which are 3-6 meters high (as well as the sides of the stone roads), are vertical and perfectly even. They meet at a right angle with other even walls, floors and ceilings. The perfectly shaped walls, floors, ceilings and other rooms with a perfect geometric proportion (rectangles, squares, crosses, etc.) could not have been created with the use of either stone, bronze or iron hammers and chisels. The marks, which are found in great numbers on the walls, were most likely left by mining machines and tools which belonged to a Neogene civilization. Most of such marks have undergone significant weathering and erosion and are covered with films and crusts of secondary minerals, which prove their ancientry. 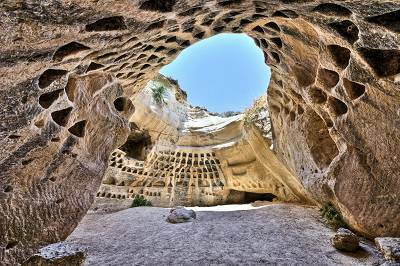 Along with rectangular halls and rooms in rock and underground cities the dome-shaped halls and rooms reaching the height of 20-30 meters are widely spread (bell-shaped caves of Luzit, Beit Guvrin-Maresha in Israel, dome-shaped caves in Bocairent and Carmona in Spain). Their walls have traces of penetration of a drill of expanding diameter – a technology, which cannot be found nowadays (as far as I know). 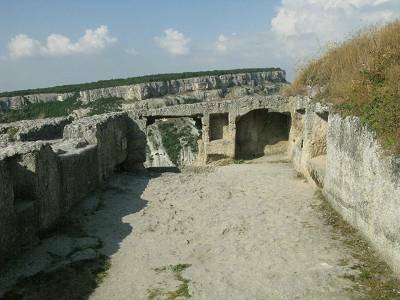 10) According to the I. Denisov’s letter, the halls in the rock city of Chufut-Kale, Crimea, which I date as Middle-Late Miocene, “have bracings similar to modern cable ducts”. The researcher came to a conclusion that those were “electrical cable ducts. The size of the bracings indicates that the cables could be strong enough to be able to withstand the voltage of tens of thousands volts.I was able to find the remains of the ancient cable. The metal literally rooted into stone (limestone – A.K.). The wiring was found both at the level of human height and at the level of 3-4 meters. These and other facts suggest a thought that in Neogene period those were the cities of builders, who were producing limestone on an industrial scale. 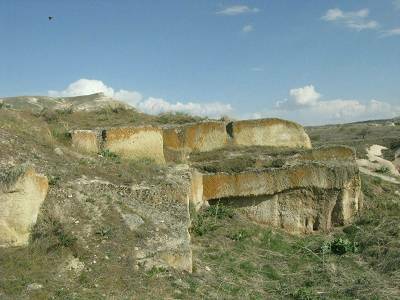 The limestone was delivered by trolleys (the ruts in Chufut-Kale and other rock cities) to the coastal areas for the construction of fortresses, as evidenced by the finds of cities along the entire coast of the Crimea at a depth of 500-700 meters". 11) Many of the historical-archaeological complexes (ruins of cities and villages, dated 10th millennium B.C. – 1st millennium A.D.) and medieval cities were built upon the Neogene rock, underground and megalithic cities and structures. In those cases they always, with no exceptions, lie deep down on the eroded surface of a rock-underground or megalithic complex with eluvium-filled pockets and other visible signs of stratigraphic unconformity. 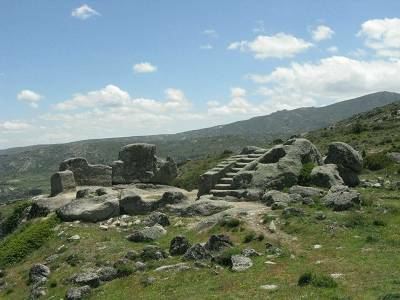 The same relations between the prehistoric and historic archaeological complexes are the most noticeable in Atlit, Jerusalem (Israel), Perperikon (Bulgaria), Bocairente, Espera (Spain) and in a number of other places. From the course of historical geology we know that millions of years might have passed between the accumulation of unconformable bedding of underlying and overlapping stratigraphic complexes – in our case it is the prehistoric and historic archaeological complexes. 12) The ruins of rock, underground and megalithic cities and structures and, possibly, stone roads, terraced mountain slopes and other manmade structures of Neogene period similar to those I have studied in the Mediterranean region stretch far to the East and over the mountain ranges of Iraq, Iran, Afghanistan, India, countries of Indochina and into China itself (the Alpine-Himalayan mountain-folded belt); the photographs I receive by e-mail and the photographs and descriptions of those rock, underground and megalithic ruins I find on the Internet give evidence to that. Particularly large numbers of the studied ruins are situated in the South-Eastern China. 13) Wide distribution of ruins of rock, underground and megalithic cities and structures of Middle-Late Miocene age in the Alpine-Himalayan mountain-folded belt is determined by the geological history of this belt. Its elevation, accompanied by the forming of mountain systems (Pyrenees, Alps, Carpathians, Caucasus, Elbrus, Zagros, Hindu-kush, Himalayas, Tibet and many other), started after the clash between Africa, Arabia, Hindustan*** and Eurasia on the edge of Early and Middle Miocene (16-15 million years ago, a little earlier in some areas, and in some – a little later). The elevation of these territories increased on the edge of Miocene and Pliocene (about 5 million years ago) and continues up to the present day. Therefore, the most parts of the Alpine-Himalayan belt never experienced marine sedimentation in the last 15 million years. It was a Neogene and Pleistocene mountainous land with rivers, lakes and swamps which at the foot of the mountains could change into plains and lowlands periodically covered by sea. Consequently, in the last 15 million years over most of the territories of the Alpine-Himalayan mountain-folded belt there existed the preconditions for both building of rock, underground and megalithic cities and structures, roads, drainage systems, terraces on the mountains slopes and their preservation in-situ up to the present day. only from a great distance. When looked at from a closer distance they gradually lose their shapes and look just like the natural mountain ranges and rock cliffs. 15) Along with significantly eroded Neogene rock, underground and megalithic complexes, stone ruts, pits, wells, stairs, ledges and many other structures there are less altered Middle-Late Miocene manmade structures. Their relatively good preservation can be explained by the fact that for a long period of time they were exposed to the eluvial-deluvial sediments (created by the mountain erosion), alluvial (created by rivers) sediments, lake and swamp, or eolian (caused by wind) sediments, or were overlapped by the tuffs, that were erupted and deposited in continental conditions (Phrygian valley, Cappadocia in Turkey). 16) Since the beginning of the construction of the Neogene metal, rock and underground cities and villages, ledges on the mountain slopes, drainage and irrigation systems, digging of pits, wells, ditches, graves, stairs and construction of roads and up to the present time, i.e. in the last 15 million years, the consequences of a few Middle-Late Miocene, Miocen-Pliocene, Pliocene, Pleistocene and Pleistocene-Holocene catastrophes have showed themselves significantly in the Alpine-Himalayan mountain-folded belt. They were accompanied by the formation of faults and cracks with secondary mineral formation, folding (though an insignificant one) and local volcanic eruptions. At least two of those catastrophes had lead to the displacement of the earth’s axis and formation of huge tsunamis more than 1 kilometer high – the Miocene-Pliocene catastrophe (5.3 million years ago), also known as the Messinian Event, and the Pleistocene-Holocene catastrophe (11,700 years ago), which I singled out during the grant research on “Paleography, climate and states of Eurasia in Pleistocene” sponsored by S.A. Kozlovsky. Math modeling of the catastrophic event on the edge of Pleistocene and Holocene conducted by V. Shevchenko showed that 11,700 years ago in a few regions of Eurasia and Alpine-Himalayan mountain folded belt it raised a tsunami with a height estimated from 1 to 3 kilometers. It would be logical to assume, that 5,3 million years ago and 11,7 thousand years ago such enormous waves would have washed away the thin cover of Middle-Late Miocene, Pliocene and Pleistocene continental sediments and soils and outcropped the ruins of the Neogene rock, underground and megalithic cities and structures, stone roads, ruts, terraced mountain slopes, etc. in many places along the Alpine-Himalayan mountain folded belt. That is why these manmade complexes and structures are so widely spread across all of the Mediterranean region and Alpine-Himalayan mountain folded belt and very few of them bear traces of strong eolation, typical for the Neogene residual outcrops. 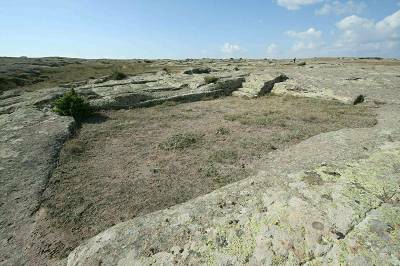 As you can guess, the destruction and eolation of many rock, underground and megalithic structures and ruts had started only in Holocene, after the Pleistocene-Holocene catastrophe (11,700 years ago). 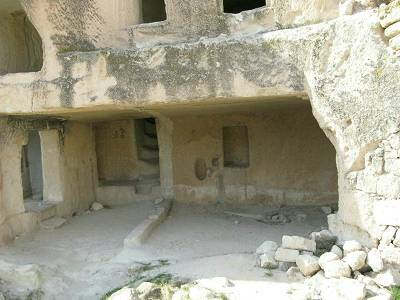 17) In the underground cities of Cappadocia and Israel one can easily notice the traces of one (Pliestocene-Holocene) or two (Miocene-Pliocene and Pleistocene-Holocene) floods, which washed away the Middle-Late Miocene, Pliocene and Pleistocene continental and coastal-marine sediments that overlapped the Neogene man-made structures. A huge tsunami washed away all the rock dumps, excessive amounts of which must have left after the construction of large underground cities. Moreover, it covered the floors of the underground rooms and halls with more than one meter thick lime-clay deposits with oblique lamination and ripple marks (Maresha, Israel). In Cappadocia, Turkey, and Beit Shearim, Israel, the deposits are not that thick – only a few centimeters as a rule, but also marked by ripples. 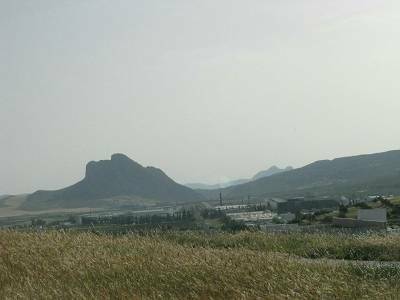 Miocene rock complex cannot be reliably compared to any manmade formations (rock sanctuaries of Kamaka, Belintash and the Deaf Stones in Bulgaria, rock complex Castro de Ulaca in Spain, etc.). Nevertheless, these places have been known as sanctuaries for a very long time; dolmens, seids, cromlechs were built atop of them and sometimes (Castro de Ulaca) even well fortified medieval towns and fortresses. Round holes and funnels are abundant over the rock surface of many of these Neogene complexes, sometimes separately standing manmade rock structures, or ruins of walls of megalithic laying can be found there. According to S. Ivanova, my partner in the expedition to Spain in May 2016, whose opinion I take very seriously, those hardly identifiable stone sanctuaries could be the cities which were later destroyed in the course of wars waged by our ancient ancestors. 19) Construction of historic (10th millennium B.C. – 1st millennium A.D.) and medieval cities, fortresses and sanctuaries of different historical periods over the ruins of the Neogene rock, underground and megalithic cities and villages, which is observed almost everywhere, testifies not only that the Neogene civilization was a civilization of highly qualified cultural builders, but what is more, it tells us that our distant ancestors were perfectly aware of the energetic structure of Earth and were building their cities and villages in places that were favorable for healthy living (so called positive energy zones of Earth). 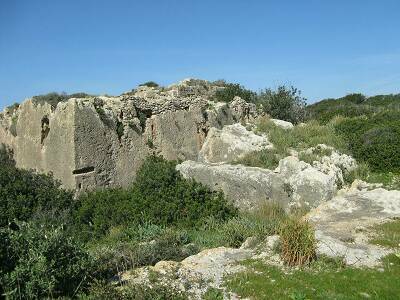 20) The Neogene rock underground megalithic complex, which spreads out through the entire Mediterranean region, most likely was not built in a day. The building of the cities, villages and fortresses which form it could be performed in different periods of time between which 5 or even 10 million years could have passed. It is a long period of time not only for the modern humans, but for our ancestors as well, even though, apparently, they could live up to a 1,000 years. That is why, as of yet, it is impossible to give a straight answer to the question “What the Neogene civilization was like?”, until a thorough additional research is conducted by large groups of archaeologists, geologists and folklore researchers. In the beginning of my research I thought that it was a highly developed civilization of humans, elves, dwarfs, hobbits and other intelligent creatures (as it is shown in the “Lord of the Rings” movie), who lived in harmony with nature and who worked on modifying the landscape to improve it. Now, after so much information about road construction conducted by the Earth’s inhabitants of the Neogene, the using of automobiles and cross-country vehicles, construction and mining engineering, electricity, etc. has come to light, it seems even more possible that in Middle-Late Miocene (15-5 million years ago) the harmonious and technogenic civilizations were taking turns in predominance. Perhaps, these periods of predominance were segregated by world wars, which could destroy one Neogene civilization and lead to the heyday of another. These wars, in which nuclear, laser, geophysical and climate weapons were used, are described in the Indian legends and, to a lesser extent, in the legends of other nations. In conclusion I would like to answer the most possible question of some of my readers. One of them is “Where are the skeletons of humans, other intelligent creatures of Mediterranean region and numerous units of equipment and machinery?” I answered this question seven years ago in the following works: «Why did so Few Remnants of Highly Developed Civilizations Save?», «Mineral Oil (petroleum) and Gas - the Altered Remnants of Perished during Catastrophes Plants, Animals and People» and «Mineral Oil (petroleum) and Coals with Heightened Contents of Uranium, Vanadium, Nickel, Iridium and Other Metals - the Sediments of Epochs of "Nuclear Wars"». That is why I only have to add to my previous arguments that the vast majority of the remains of Neogene civilizations had been washed away by the gigantic tsunamis and then buried in the inter-mountain, foothill troughs and at the foot of the continental slopes. What was left are the ruins of rock, underground and megalithic cities, stone terraces on the mountain slopes, stone roads, ruts and other manmade structures on the Neogene leveling surface - it was not in the power of those tsunamis to destroy and wash them away. On the contrary, the tsunamis cleared them from the overlapping loose Middle-Late Miocene, Pliocene, Quaternary sediments and soils and opened them to the prehistoric, historic and modern man in their original state. 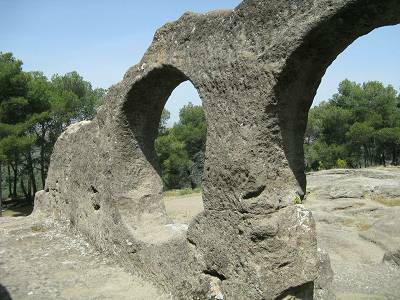 We should also admit the fact that the massive outcroppings of Neogene constructions in the Mediterranean region has been used as foundations for the construction of new cities, settlements, fortresses and temples since long time ago, and in some places – as dwellings, cellars and warehouses. As for the evidence of existence of the Neogene human, other intelligent creatures and animals, there are many other proven methods to discover them. For instance, we have found a chain of Neogene camels’ footprints on a petrified road in Bocairente, Spain, footprints of three-toed feet about 29-30 centimeters big with the dynamics of the step as of a human, and shoeprints of the same size in Castellar de Meca, Esperilla and Espera, Spain. Initially, many people deemed them fantastic. However, the following seven years of geological and archaeological expeditions to different areas of the Mediterranean region confirmed the realism of my reconstructions and proved the correctness of the research methodology at the junction of geology and folklore. Read my other new works on the Neogene civilization "Humanitarian mission in the Neogene – the heroes who saved victims of flood who had taken refuge underground (continuation of the article “Automobile roads (cart ruts) of the Neogene time in Central Turkey”)", "Crimean petrified wheel tracks - the Neogen roads", "When were the rock and underground towns built in Mediterranean region? Geologist view (reflections after a trip to the Crimea). Part 1. Critics of official dating for the rock and underground towns", "Neogen (15-6 million years ago) road and track global network in Mediterranean", "Middle Earth - the real country of the Neogene period"